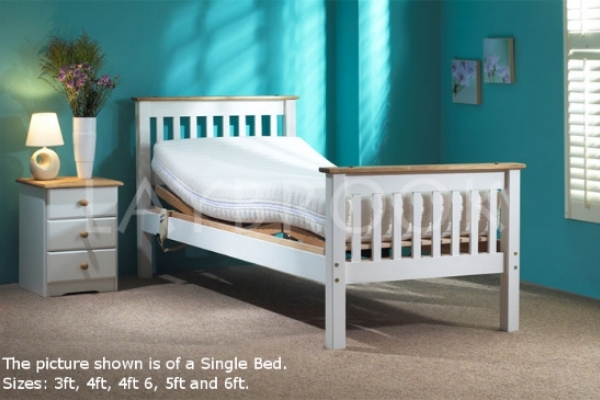 The White Huntly bed is a shaker-style electric adjustable bed, white with waxed tops. This beautiful piece looks superb and has plenty of room underneath for storage, and comes with a Reflex mattress upgrades available. The bed has plenty of room underneath for a bed table or storage. This bed comes with a full 5-year warranty & Reflex mattress unlike some other companies, we only sell beds made from the best quality materials and as with all our adjustable beds if you are not totally satisfied with your purchase within 7 days we will fully refund you the cost of the bed. It is also fully installed by our trained engineers, NOT FLAT PACKED like some. Standard size for the White Huntley is 23 inches from the floor to the top of the mattress. To make sure the height of your bed is correct when ordering, please measure your own first. We are able to alter your bed to a height of your choice for an extra £75! The Vertical Lifting Mechansim is not available on this bed.